Morning until 2:30: Coffee shop and Pike Place Market with the family. 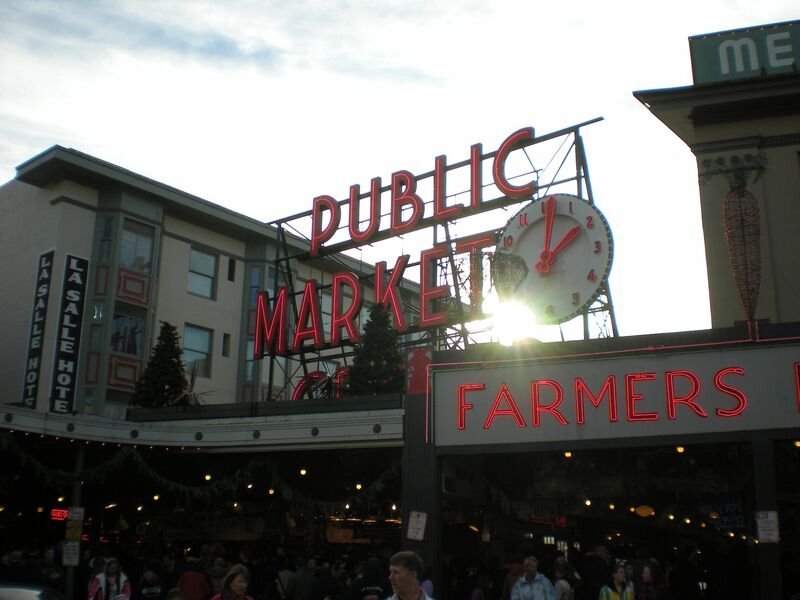 Gingersnap lattes, cold and sunny Seattle, chatty vendors, fishy smells, street musicians and fresh-fruit samples. Yum. 2:30-6:30: Parked on the couch with the Christmas tree lights on. Typing up revisions from the official print-out and reading through TIB from the beginning. Pumped up about the results! 6:30-7:00: Brain food for dinner — chicken tikki masala and salad with fresh avocados. 7:00-7:30: Revising. Back starting to ache. Pushing through. A little over halfway through the book. Still jazzed about EvErYtHiNg! 7:30-8:00: Drive to the local indie video store to get Julie and Julia for a movie break with mom and sis. Apparently the rest of Seattle had same plan — no copies left in this or other store. 8:00-9:00: Back to revising. New spot in the kitchen with a mug of Lady Gray tea. Guitar music. 9:00-10:00: Speed Scrabble tournament with family. (Speed Scrabble is Scrabble without the board — everyone makes their own little word-puzzles; it’s much harder and much more fun). I win almost every game; I am a champ. 10:00-10:30: Facebook, AW, brushing teeth. 10:30: Curl up in bed with Christmas lights around my window. Computer on the bed, print-out in my lap. Goal: finish reading through the rest of TIB to get a feeling for the entire book. Question: does the new-ish ending work? 12:02-1:44: Glued to the book. Creeped out by the ending. Too dark outside! House is too quiet! Teary for the first time ever — because the ending is sad or because I am past exhausted? So now this round of revisions will be basically done after a few more touch-ups. Hurray! Time to breathe, sleep, and read books… and blog again! Also, I’ve been reading your teasers, and they’re so much fun! Glad you’re posting them. I know, I don’t stay up past midnight to write very often — so it was fun. And creepy, definitely. DUDE. I finished revisions (except for some polishing) two days ago at almost exactly the same time. CREEPY. Woah. CoNgRaTs on finishing! That’s crazy; we are basically twins. Fun day haha! Speed Scrabble sounds like a blast.